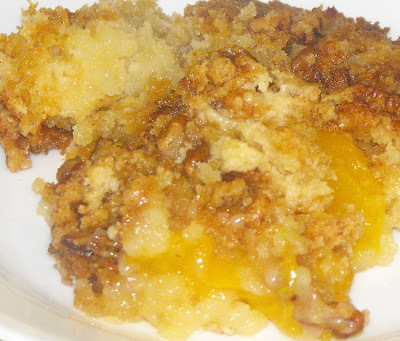 I already have a really good, simple recipe for peach cobbler that I love, but I was looking for something just a bit different to make, using ingredients I already had on hand. I came across a couple of different versions of peach cobbler made with cake mix and decided to give it a try. Grease or spray a baking dish--I didn't have a lot of peaches, so I used an 8 1/2 x 11 inch dish. Pour in the peaches, juice and all. Add the whole package of dry cake mix on top, smoothing to the edges and into the corners. Sprinkle with cinnamon and chopped nuts. Bake at 350 degrees for about 35 minutes. Cool for just a bit, if you can stand to wait. It smells wonderful, and tastes just as good! I'll be honest, I have a peach cobbler recipe that I love already, and I was a bit hesitant about the cinnamon and nuts, which I don't usually associate with peaches. But I have to say, the taste on this just blew me away. It's a whole different taste and texture from the one I usually make, but it's every bit as good. The nuts added texture and taste that set this apart from the ordinary. I'll definitely be making this again--this one is a keeper! Oh my goodness that looks so good!!! I don't think I've had cobbler with pecans...and I don't know why? I'm going to do it soon for sure! mmmmmmmm, and makes me wish I wasn't trying to lose weight at the moment. could so eat that with lots of whipped cream and good quality vanilla ice cream. Great looking cobbler! And so perfect to go with all this cold weather we're having! Oh, That looks really good!! I probably have your other recipe. I've never made one with the cake mix. The nut topping is different too. I'm going to make this tomorrow!! I guess we were thinking the same thing this week. I posted my version today. It is such an easy and yummy dessert. Thanks for sharing your version. This is one of my family's favorites. I have done it with fresh peaches, when they are in season and blackberries, too. Yum! Think I'll add peaches to my grocery list! Included your recipe on my Fri Favorites list! Someone else posted this recipe today also. I'll tell you what I told her — if I use cake mix I call it a dump cake and if I make it from scratch I call it cobbler. I've seen some variation of this recipe before but had forgotten. Yours looks delicious and thanks for posting...maybe I will remember and give it a try now. This really looks so simple and so good. Thanks for sharing this recipe with us. I hope you're having a terrific Foodie Friday. This is a wonderful recipe. Not only does the cobbler look delicious, it's a time saver. Thank you! Would you consider adding this to my meatless Monday link. This looks so good, I would love to include it. Thanks. Thanks for adding the cobbler to Meatless Mondays. I appreciate it. It feels good to have great recipes listed.